The purpose of this guide is to aid authors in creating images that are compatible with the World of Warcraft client and help them optimize their images for use in add-ons. XnView - For opening and viewing BLP files. XnView not only supports BLPs but also includes an image browser and is one of the best at exporting BLPs to PNGs while preserving transparency. Photoshop - One of the best (and most expensive) image editors available. I use this for saving my images in the TGA format. The GIMP - An extremely powerful and free image editor. If you've ever installed the Interface Add-On Kit or extracted one of World of Warcraft's MPQ files, you will have noticed that most of the images have a .blp extension. Unfortunately, very few image editors support BLP files and then only through plug-ins. Luckily, the World of Warcraft client supports both BLP and TGA files natively. 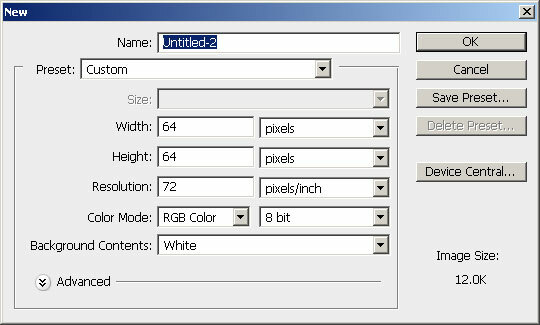 TGA files are your basic RGB raster image. The advantage to the TGA format is the support of a fourth channel (the others being Red, Blue and Green), the "Alpha" channel. An alpha channel is a "channel" (like a layer) that uses various shades of gray to control the transparency of a given pixel. Pure white is 100% opaque and pure black is 100% transparent. The result is the ability to use partial, or "alpha" transparency in the image. In the first example, you see just a black square. This is the actual content of the image. In the second example you see a fading circle of white to black. This is the alpha channel. In the third example, you see the effect that the alpha channel has on the image itself. If your browser supports PNG images, the fourth image is an example of how the image would actually look in-game. The height and width of the image can be no larger than 1024 pixels. The image itself must be an uncompressed, 32-bit (24-bit+Alpha @ 72dpi) TGA file. Open your favorite image editor. For this guide, I'll be using Photoshop, however, you can use whatever you have available. Just keep in mind that some steps may be different depending on the editor that you're using. Note: I'll try to be specific about certain settings and post a sample image where applicable, but I'm not going to go into detail about how to do specific tasks for each editor. Create a new layer above the background. On the new layer, place some content. This can be just some generic shape you're using while following along with this guide. 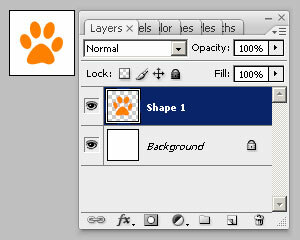 For the sake of this guide, I'm going to go with an orange paw print (a preset shape available in PS). At this point, you'll want to change the color of your background to black, unless your content is black. You might also want to flatten the image depending on the editor that you're using. Saving the image in a format compatible with the WoW client is as easy as making sure the export options are set correctly. The following is a screen shot of Photoshop's Targa export options (accessed via "Save As" then select "Targa (..)" as the file type and then click "Save"). The options should be set exactly as follows, otherwise the image won't work. i think the size limit is 256 by 512 as well or did that change in 3.0? Actually, I'm pretty sure it's 512x512. But thanks for reminding me. Someone can correct me if I'm wrong. The size limit has been upped to 1024 in both dimensions since patch 3.0. Thanks, Xin. Fixed. And updated! Edit: Since most addon sites re-compress all an addon's files in a ZIP archive anyway, RLE compression is unlikely to save them much bandwidth. At best, it will save you and your users some disk space, and save you a small amount of time when uploading the files. I tried using GIMP, it was easier. You just draw with a transparent background, save as TGA, and the program automatically fixes the alpha channel and correct 32 bit mode. the images are not showing up for me? The images show fine for me. They're even posted as attachments to the posts they belong to (and that's the url used to display them in the post itself). How to do you create an alpha channel? I'm not really sure what you mean. Every modern image editor (GIMP, Photoshop, etc.) defaults to including an alpha channel on every layer of every image, with the only exception being if you're working with the original single layer from a JPG image or some other format that doesn't support transparency. If that's the case, just Ctrl+A to select all, Ctrl+C to copy, and Ctrl+V to paste the image onto a new layer, and feel free to delete the original layer. (If you just duplicate the whole layer you probably won't get an alpha channel for it.) If you need more help, you're going to have to be more specific. I'm having quite some hard time using my own images in an Addon I'm making for the first time, and I have follow the steps above to create my own tga files as well as using known wow compatible third-party tga files. However, my addon only loads a green background when I try to set such images as the background for a frame. If any one of you at all can tip me in on how to fix this issue I would be very grateful. Is your original image set to dimensions which are powers of two? Like 128x128 or 512x512? And did you try this? /edit: also, did you completely exit WoW? And what is your code?